I strive in my art to honor feathers and the birds they came from. Some talented people paint on them but it is not something I am drawn to do. That said, I came across a man’s work that impressed me: Super Regalia. He paints mostly to imitate feathers that are otherwise illegal to have—like hawks and eagles; or painted to look like rare and hard to find feathers like the tails of Red-tail Black Cockatoos. These feathers caught my eye because it is hard to tell them apart from the real thing. 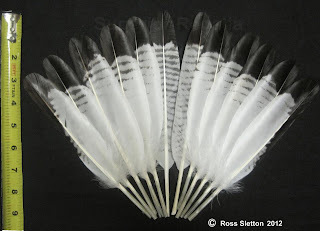 He sells them and uses them in Native regalia—fans, bustles, and such.